The seventh graders engage in a huge project with Ms. Rhodes book, Ninth Ward. Visiting with the author did not happen until the last hours of the last day of school. The students had lots of questions and was able to share some of what they saw when they went to the Ninth Ward in New Orleans to walk in the footsteps of the characters. 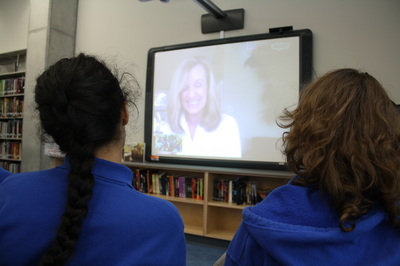 Read about the skype visit here. You can read more about the whole project on the librarian's blog. See the products that the students made documenting the field trip that they took in March. Authors Kelley Armstrong and Melissa Marr were in New Orleans for the RT Book Lover's Convention and because this visit coincided with the release of the second volume in their Blackwell Pages series, they included a school visit on this trip. The students in 6th and 7th grade got a chance to learn about the books in the series Loki's Wolves and Odin's Ravens and how Norse mythology plays a big part in both books. Check out the pictures of the students holding the shield and learning how to move it to attack an enemy or protect oneself from being attacked by an enemy. Read more about this visit on the librarian's blog here. Thank you Little Brown and Octavia Books for making this visit possible. 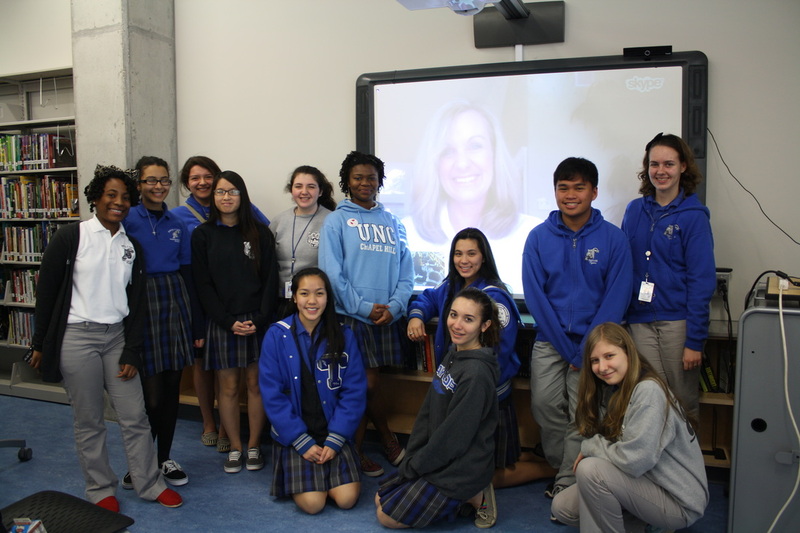 Ms. Kahn, the librarian, met Deb Caletti at a conference and invited the author to talk with members of Bookmarked. 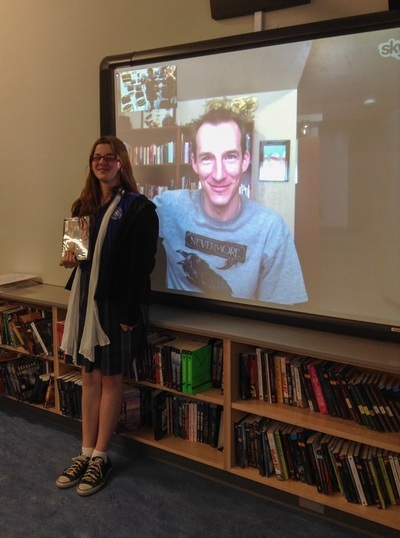 Caletti is the third author that Bookmarked has met via Skype this school year. Her approach to writing is so different to that of the other authors. However, like Mitchell and Myers, she has a great passion for writing. It was what she wanted to do from a very early age. She did explain that writing is her job, and the means by which she supports herself, so meeting all deadlines is imperative. 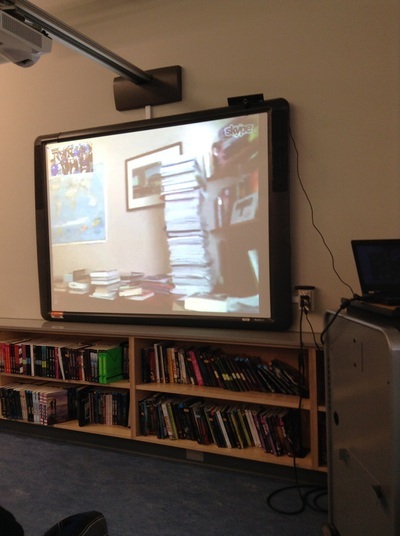 Read more about the visit here on the librarian's blog. Todd Mitchell visited via Skype with Bookmarked to talk about his book, Backwards. This book is very unusual because the story is told from the point of view of two main characters, one who is moving forward in time and the other who is moving backward in time. Todd wrote the book because he felt the need for a story that addresses teen suicide. You can read more about what Todd has to say on the librarian's blog here. The students at PFTSTA lucked out when Jenny Han and Siobhan Vivian were in New Orleans for the SIBA conference because the two authors included school visits as part of their travel plans. The sophomores and juniors were out in full force to learn how two authors met and became collaborators. They met in school while studying to become authors of children's literature. They also developed a strong friendship that went beyond their common interest in writing. The trilogy that they are writing together is all about high school and seeking revenge on those who have done you wrong. One interesting point that they emphasized was that the revenge rarely works out well for the perpetrator or the victim for both of them turn out to be on the losing end. 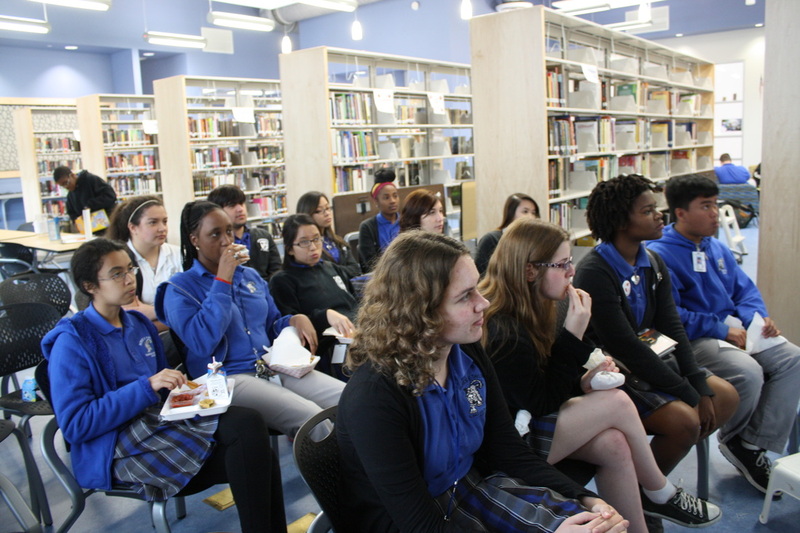 This event was brought to PFTSTA by Judith Lafitte at Octavia Books and Simon & Schuster publishers. You can read lots more about this wonderful visit by going to the librarian's blog here. 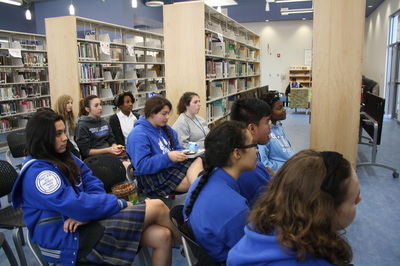 On Wednesday the 11th, high school students gathered in the library during their study hall to meet Walter Dean Myers. 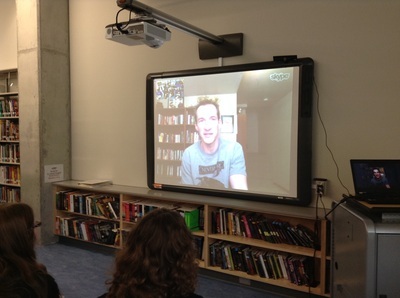 Myers is near the end of his two year stint at the National Ambassador for Young People's Literature. 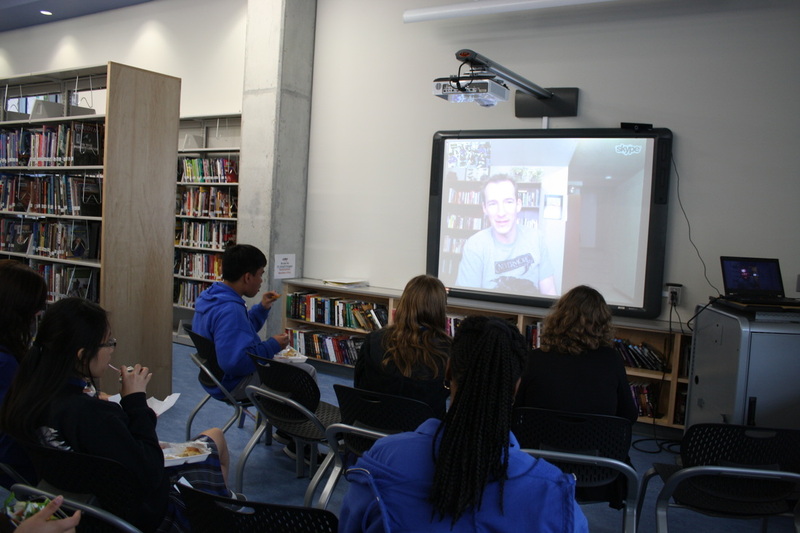 As part of his role as ambassador, he has been making skype visits to libraries across the US to talk to young people and explain the role that reading and writing has had on his life. His mantra has been, "reading is not optional." The students hung on his every word as he talked and joked and answered all their questions. When it was over, the students had me capture a picture of the students with Myers on the screen. You can read more about this visit on the librarian's blog here. 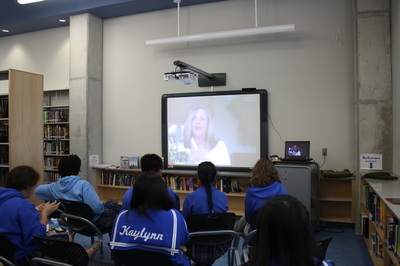 We want to thank The National Ambassador for Young People's Literature program that is administered by Every Child a Reader, a literacy nonprofit whose mission is to instill a lifelong love of reading in every child, and is co-sponsored by the Center of the Book in the Library of Congress and the Children's Book Council for making this skype possible at PFTSTA. It was a thrill to have an author of such esteem visit our school in Avondale, LA. Susan Cooper is touring for her first book for young people in seven years. She spent three years on the research for Ghost Hawk, and it shows. Though there is a fantasy element in her story, there is also lots of history. She said that it is important for her to have accuracy in her novels, as she doesn't want to hear from a twelve year reader correcting her on the historical elements in her works. Her favorite genre to write is fantasy, and the book she likes the most is her Dark is Rising. Expect to hear more from her because she plans to continue her writing for as long as she is can. Cooper's visit was made possible by her publisher Margaret K. McElderry Books and Simon and Schuster, as well as local bookstore, Octavia Books of New Orleans. She can read more about her visit on the librarian's blog here. On September 3rd, the 6th and 7th graders were given a special treat when authors, Margaret Peterson Haddix and Lisa McMann kicked off the tour for their new books at our school. It was also the first library sponsored event in the brand new library. We couldn't fit both classes in the library at the same time, so we had two sessions--one for 6th and one for 7th grade. We cleared the tables and chairs out of the teaching area of the library, and the students sat on the floor. Now we know that we can fit one whole grade level in the library. Both authors had a slide presentation with video to share with the students. 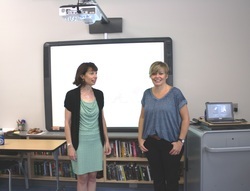 They shared their inspiration for their series and were able to captivate the students. With the all the holds placed on the first books in their respective series, Found and The Unwanteds, we know that they hit a home run. Thank you Margaret and Lisa for sharing your stories at PFTSTA. You can read more about this visit on the librarian's blog here. 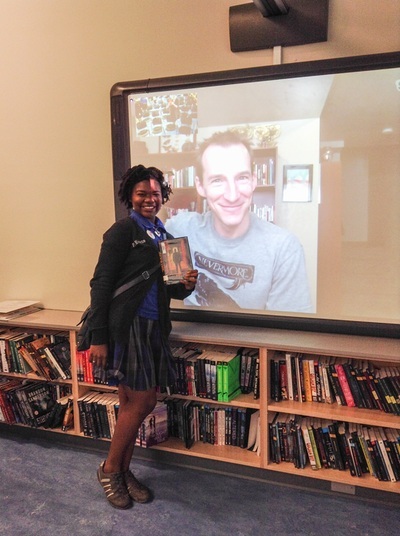 Thanks goes to Judith and Tom at Octavia Books in New Orleans and Simon and Schuster Publishers who made this visit possible at PFTSTA.